After searching a bit I came to know that the above provider is not installed, and I need to install the Microsoft Access Database Engine setup, to facilitate the transfer of data between existing Microsoft Office files such as “Microsoft Office Access 2010” (*.mdb and *.accdb) files and “Microsoft Office Excel 2010” (*.xls, *.xlsx, and *.xlsb) files to other data sources such as “Microsoft SQL Server”. –> Get the Microsoft Access Database Engine 2010 Redistributable, [link]. If your SQL Server is 32 bit, then install just the first one. But if its 64 bit, then install both, first 32 bit & then 64 bit. 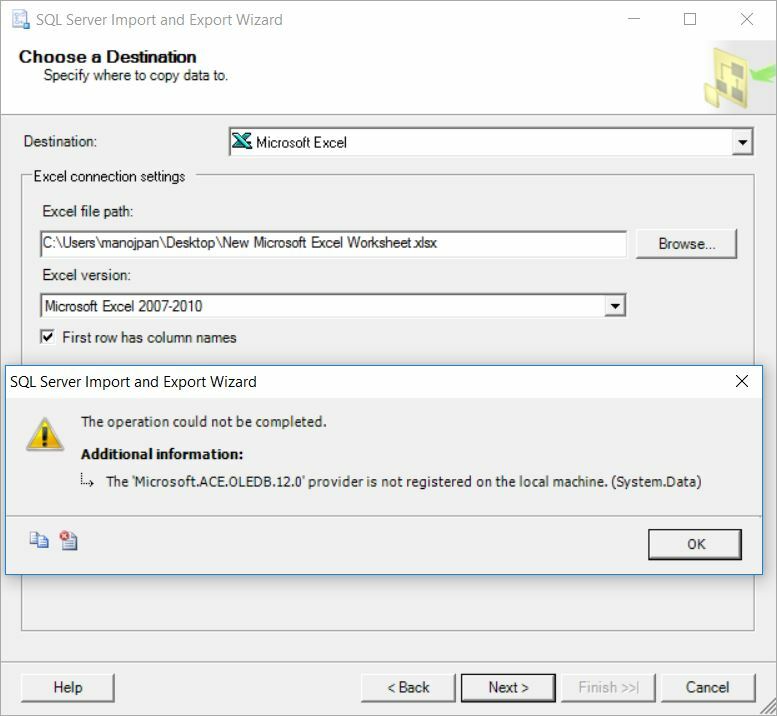 Thanks for the post,recently i faced same issue when i was importing data from excel into sql server.